Lighting is arguably the most important element of any room. Not only does it provide a vital function, it adds an important decorative element and can significantly contribute to a room’s overall atmosphere. In every room it’s important to have the three main types of lighting: ambient, task and accent. Ambient light provides the overall illumination, task lighting directs light to certain work areas, and accent lights provide drama, highlighting specific objects (such as a piece of art or sculpture). Since living rooms have no specific purpose (unlike a kitchen or bathroom) it’s important to have lighting that can sufficiently illuminate whatever activities take place there. It could be reading, watching TV, entertaining, etc. The best way to achieve this is to scatter different types of light throughout the room. Along with having the three main types, it’s also important to make sure that lights are placed at different levels throughout the room, beginning at table height and going higher - all the way to the ceiling. There are several different types of lights that should be considered for a living room and any other room for that matter). Overhead lighting consists of lighting that is mounted to the ceiling such as pot lights, track lighting, and flush/semi-flush mounts. These types provide ambient light, filling up the entire room with basic illumination. Occasionally they can also be directed to certain areas providing something close to task light (although since they’re mounted on the ceiling they’re often a bit too far away to provide direct task light). Hanging light fixtures such as chandeliers and pendants are fixed to the ceiling but hang down providing something between ambient and task lighting (depending on the size and placement of the fixture). People don’t often associate these types of lights with living rooms, but they can be excellent additions adding style and drama. Table and floor lamps are generally used as task lighting and additional ambient lighting. Overhead lights may not reach to all corners of the room, so use lamps as fill lights wherever needed. Decoratively speaking, there should be a mix of the two in a living room. Scatter them throughout and place them wherever light is needed (next to a reading chair or sofa for instance). Sconces provide almost exclusive accent lighting. They’re typically lit with small chandelier bulbs so the amount of light emitted is limited. However, sconces can be great for creating soft mood light. They’re also wonderful as decorative accents. The types of lights that are used in any room have a huge impact on the space – not just in terms of the actual light provided, but in the decorative style of the room. Ceiling fixtures, lamps and sconces are available in every style, shape and color imaginable so use them to their utmost potential. 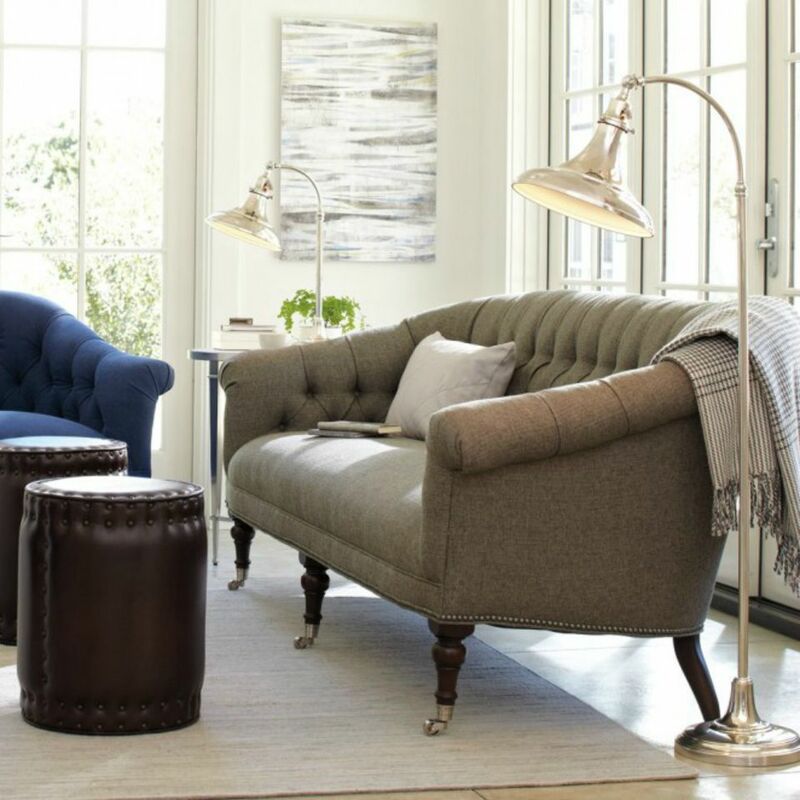 Install swing arm sconces over end tables instead of using table lamps. They can be pulled over and used as reading lights when necessary. Place matching table lamps on a console for a formal look. Use a chandelier in a living room with high ceilings to draw the eye upwards. Flank a mirror or piece of art with sconces. Hang a pendant light over an end table for a unique look. One of the best things you can do in a living room is to install dimmer switches to every single light source. It is without a doubt the easiest way to instantly change the mood. Low light is generally more flattering, but not always practical. With dimmers you can change the amount of light instantly. Keeping the lights dimmed also saves energy and ultimately, money. The most important thing to remember is that variety is key. No matter what your style, vary the size, placement and intensity in order to get the right amount of light.